The Jerusalem Post reports: The first images from Venus – the research satellite of the Science and Technology Ministry’s Israel Space Agency that was launched at the beginning of this month – have been received, including a photo of the Jerusalem area. 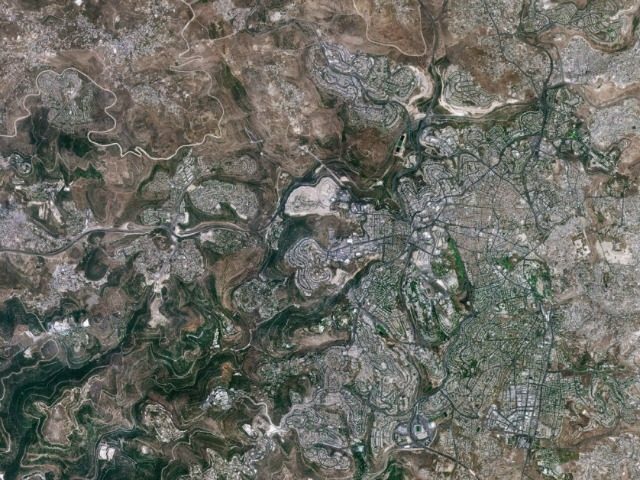 An image taken by the satellite’s sophisticated camera enables us to see Jerusalem and its environs in unprecedented quality, while distinguishing among different ground details. Science and Technology Minister Ofir Akunis said on Wednesday, upon publication of the pictures, that the beauty of Jerusalem is seen also from space. The success of launching Venus is reflected in the first pictures received, and this is only the beginning, he said. In the coming years, humanity will enjoy the photographs that will help groundbreaking studies in the fields of the environment, earth sciences, water and food, he continued. The Jerusalem area is prone to frequent raging fires, mainly during periods of heat and drought. The information that will come from Venus will help scientists develop new methods for characterizing the ecosystem in the region, understanding and reducing the risk factors, and will also advance the study of global warming. The picture of Jerusalem illustrates the kind of information that the satellite will produce in the coming years to further studies that will affect agriculture, government policy in a range of areas, and economics, the ministry said.